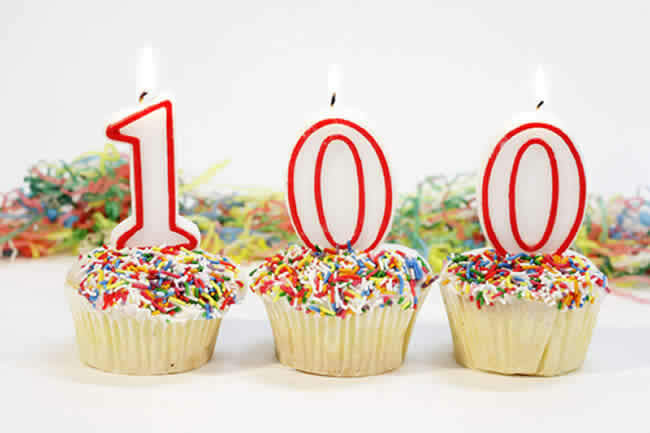 Today, I have reached a blogging landmark: my 100th post! In honor of this occasion, I have decided to share with you 100 nutrition tips. Each tip is from one of my previous posts, starting with my very first post and working up to today. Each tip’s number links back to the original post. If you see a tip you like and want to read more, just click on the number. Enjoy! Nutrition advice can seem confusing, but in reality, it can usually be boiled down to one simple piece of advice: Enjoy a variety of whole foods for better health. Whole foods are foods that are as close to their natural form as possible, with minimal processing and refinement. Foods created by mother nature contain countless nutritional benefits, such as fiber, vitamins, minerals, and antioxidants. Foods created by humans in a laboratory (processed foods) contain only a few of those nutrients, and usually a great deal more of unhealthy additives, such as sodium, trans fat, preservatives, and added sugar. The below list shows some examples of whole foods vs. processed foods. The best, whole food choices are in the left-hand column. The more processed the food, the fewer nutrients and greater number of unhealthy added ingredients it contains. Check the list of ingredients: In general, healthier food products contain a short list of ingredients that sound like food (and not like chemicals). Healthy ingredients to look for include: whole grains, fruits, vegetables, and skim milk. Ingredients to watch out for include: sugar, high fructose corn syrup, hydrogenated oils and enriched flour. Keep in mind that some of the healthiest food items do not contain nutrition labels at all, like fruits and vegetables! Find a farmer’s market: Visit your local farmers market for some of the best-tasting whole foods on the planet. Visit http://www.localharvest.org/farmers-markets/ for market times and locations. Spice it up! Spices can add flavor and nutrition to food. Cinnamon, allspice, cloves, cardamom, mace or nutmeg bring out the sweetness in whole foods. Black pepper, garlic, curry, cumin, basil, ginger, and onion can replace salt and bring out savory flavors. How do you find and enjoy whole foods? Will the Real Whole Grain Please Stand Up? Eat Your Way to Happiness, by Elizabeth Somer, MA, RD, is a fun read that is packed with good nutrition advice. There is no doubt our lifestyle and food choices can affect our mood. However, with my newfound Health at Every Size approach to health, I’m skeptical that this book will make you “blissfully thin,” a term to which the book constantly alludes. I think that self-acceptance, combined with the habits promoted in the book, will make you blissful at weight that’s healthy for you. Eat Real 75% of the Time: “Eating real” means choosing foods that are as close to their natural form as possible, with minimal processing and refinement. Choose High Quality Carbs: As in whole grains, not refined. Adopt the 6% Solution: Aim for only 6% of your total calories to come from added sugar. Not 25%, which is where the average American is at right now. For a 2000-calorie diet, 6% translates to 30 grams (2 Tablespoons) of added sugar. This does not include sugar found naturally in fruit or dairy, so eat plenty of these! The One Habit Your Must Embrace to Be Happy, Fit and Healthy: Exercise. Period. According to Somer, "Nothing you do will have as big an impact on your weight, as well as your mood and health both today and in the future, as exercise.” Exercise gives you a natural endorphin rush, boosts self-confidence, fights fatigue, soothes stress and enhances sleep, all which lead to improved mood. Learn more at the book’s website: Eat Your Way To Happiness. Also available on Amazon.